On the surface it would seem simple to do research in education to decide what we could do better to teach children. Unfortunately, it's not, and there are a lot of misconceptions about research in education, on the part of teachers, non-researchers and parents. In this series we'll try to explain, in simple terms, without the jargon, how research is done, and how it's not easy to use it to inform decisions about he education of our children. If you want to make better decisions about what works and doesn't in the classroom, you need to understand the nature of educational research. Here's the starting point, and there's a few shockers. Peer-reviewed educational journals are the best source for educational research, but here's a look from the inside. Understand the process and you'll see that there's potential for bias, and distortions of the body of educational research on any one topic. There are more and more Pop Ed. books that cite many research studies, but beware, because they are often written by people who lack the competence to present an accurate representation of the research. If you are into Kohn, Gladwell, or Pink, a must read. We take it for granted. E-mail is fast, convenient, almost universal, but the Principal of Northwest High stumbled across the limitations of e-mail, and paid the price. Some suggestions about how teachers and school administrators can deal with non-violent threats. When disagreements occur between parent and teacher, each party thinks less of the other, and can see how the other is being "impossible" or difficult, but in fact often BOTH parent and teacher are making the SAME mistakes. It's an unfortunate truth. Of all the "professions" teachers get the least respect. Here's why. 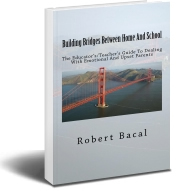 In this ERIC report, you'll find a lot of hints and advice on how to deal with disagreements between parents and teachers about how a child's school experience should be handled. Complete with some good academic references. Are Parents Really The "Customers Of Our Schools? Some schools think of the parents as customers, but is this the right way to go? No. It's easy to forget some of the simpler, and most practical methods of communication with parents about their children. In this article you'll find some ideas that you could apply immediately. Serves as a great reminder of the "little things" that make a difference. Some Parents Despise School Staff...It's an unfortunate reality. Many educators will find the views expressed in this article to be offensive, for a number of obvious reasons, since the author/parent clearly has a negative view of schools. We include this on our site because we believe that the better you understand parents of all stripes, even the nasty and insulting ones, the better it will be for the children. It's an innovative idea to have students take the lead role in parent-teacher conferences, because it sets a shared tone of responsibility about education, where teacher, student and parent share responsibility. Love it. This is a case study that described how it works. In this article you'll find some good, basic tips for working with the less cooperative parents you may come across. It's upbeat and positive, and we all need to remember that's a great attitude to have. Are you prepared to deal with the common things that happen in school board meetings? Can you keep your cool, or do you need some techniques to manage your anger? Here are a few tips, in addition to two videos showing meetings that went badly wrong. Got an idea on how to solve or at least start to address these really tough issues faced by teachers and administrators? Feel free to weigh in with ideas. There are probably no perfect solutions, but every improvement counts. It's a conundrum...parents who want little to do with the education of their children, and who, seemingly, don't care. Got a solution? Techniques to pull those apathetic parents in from out of the cold for the sake of their kids? Experts and studies seem to agree. It's not that the USA spends less on education. It's not that American teachers are worse than in Finland or Japan. It's the culture, the values the society places on education because that affects the "raw material" that comes to school, and the allocation of time on academics rather than on things that parents used to do.